Is the Boss Driving you Crazy? Are you Suffering from Harassment? Is your Workplace Unpleasant and Making you Physically or Mentally Ill? 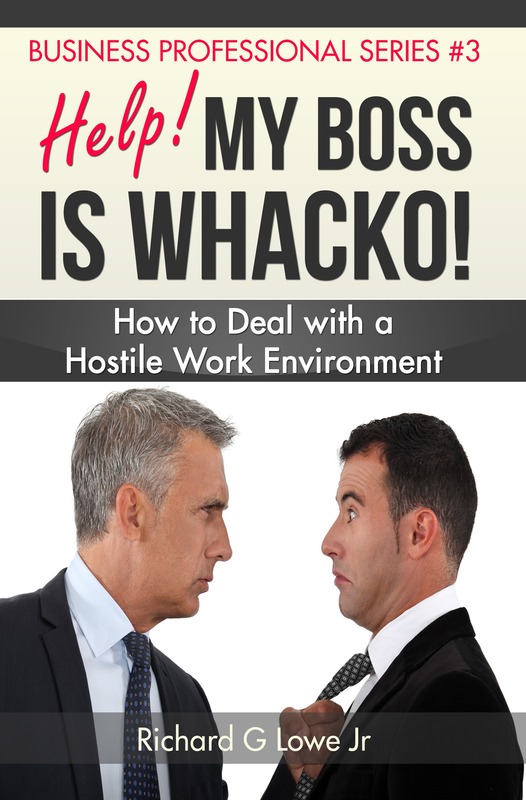 Have you ever felt like you want to Whack your Boss Because of Harassment? Would you prefer to look forward to going to work every day? Wouldn’t you like to be respected, make more money and go home feeling satisfied at doing a job well done? Well, I realized I could do something about the whacko boss. There were many options, from a simple conversation all the way to finding new employment. What I realized is it takes two to be a victim – the victimizer (the whacko boss) and the victim. I decided to break that crazy dance. Understand that you can do something to correct the situation. Learn the various options at your disposal. Build an escape route to use if the situation does improve. Find the people who can help you take corrective action. Most of us have a person called the boss, a manager or supervisor who has authority over our actions in the workplace. In the ideal situation, the boss has the power to maintain an environment that is creative and supportive. He or she works with us to set goals and objectives that align with corporate goals and objectives. Once those are defined, a good manager gets out of the way, delegating the appropriate amount of authority and responsibility, and lets us do our job. Discipline is mild, and any issues with performance are handled immediately, making the annual review process very simple. Unfortunately, the ideal boss is a rarity in today’s workplace. In many cases, supervisors and managers get promoted with little, if any, training. These people often mean well, but since they do not have the knowledge or background to understand working with teams, they tend to make many errors and often alienate their people. Business courses in college teach theoretical concepts that may not translate well into a real life workplace. These well-schooled managers enter the workplace believing they know what they are doing because they have received so much schooling and start with an air of arrogance and heavy-handedness that can lead to problems with their staff. Some managers have personalities that make them a terror in the workplace. A racist or sexist can create a very hostile working environment for their subordinates. A boss who is retiring can become very cautious since they don’t want to rock the boat and put their pension in jeopardy. Those who micromanage or are unethical create many problems with their staff. And, of course, the psychotic or hostile manager creates far more problems than they solve. The boss can be a real problem for his subordinates, because he’s in a position of power over them, regardless of whether or not he’s competent. In a disagreement, his word is favored over those he manages. Often, the boss is more trusted than those who work for him or her. The higher up the organizational chart, the more of a problem this becomes. An incompetent, harassing, or hostile boss is a headache at any level, but at Vice-President or higher can set the tone for the entire corporation. If the CEO encourages ethics and competence, then those under him will tend to be ethical and competent. On the other hand, if the CEO is hostile, angry, or fearful, then those managers underneath him will tend to take on the same characteristics. Lack of ethics at the top, by the way, is how a massive company like Enron was able to do so much harm. For those who like a calm, stable, and fulfilling job, these managers and so-called leaders make the entire organization a very unpleasant place to work. Thanks. I enjoy writing. Glad you liked the article. Stay in touch. Where was this book before, I left my job, because of a control freak,every morning I started to hate my drive to work, head aches, stomach aches, just the thought, of having to do this, made my body hurt! Small ideas really help, I quiet, I’m happy, but I could of used this along time ago! !